This is a super simple recipe, and perfect if you are on a zero food waste challenge, since you can use most of the vegetables that are about to go bad on your fridge. I love quiche, which is a French dish that usually comes with a crust, like a pie. The problem is, the crust needs butter, and you can’t replace it with oil as this ingredient substitution table says, because the cold butter will give consistence to the dough. And butter is really expensive here, and goes bad quickly, so it is banned from my shopping list, as I don’t usually cook with butter. I am left with oil, and tried this no crust quiche recipe. The real quiche comes with lard, cream and grated cheese. This one is a lighter and less expensive version. For the quiche mix, you just have to mix three eggs with a cup of flour and a cup of milk. I used cream and water since my cream was about to go bad. First mix the eggs and flour, then add the milk, salt and pepper. Dice all the ingredients you wish to include in the quiche. I used a fresh cheese, a mature cheese, a tomato, an onion, a leek, a bell pepper, and a jalapeño pepper. The mix should cover everything, but toppings should be abundant. Add all that to the egg and flour mix, pour into an oiled Pyrex, and bake for 40 minutes at 180 Celsius, 350 F. Easy, right? The cost of this vegetable quiche was about $3 for six servings, it is a perfect dish to bring to a party, you can serve it cold, it tastes better if you leave it out of the oven for at least half an hour. You can cut it into small cubes and serve it with toothpicks to your guests. This post was featured on the Mo Money Mo Houses, thank you! That’s a nice looking quiche. Although, personal opinion, it needs meat. I would probably fail the no food waste challenge. Living by myself, it’s virtually impossible to not wind up throwing out some vegetable or another every week. They just don’t last as long as they should. It is much harder to manage food for one. I have checked a few tips to make the food last longer, for example I used to think avocados had to stay outside, and in the fridge they last much longer, or I keep basil in a glass of water instead of the fridge and it lasts more, etc. I also read bananas get ripe quicker if they are next to tomatoes. I live alone, but don’t waste too much – I try to buy based on what a recipe calls for (and no more), cause waste really gets to me! I like the crust but like pizza I like it thin and the ready made ones were usually too thick. Dough less is much quicker and a bit lighter as well. I’ve never, ever, ever had a quiche, but it looks delicious! I especially like finding vegetarian options as my wife can’t eat meat or pork, so this could definitely be an option. Thanks for sharing! it is really good, and easy to make. kind of like a fritatta or a salty flan. the cheese will melt at the bottom and the flour helps make the whole thing stand together, or you can make the same with a ready or home made dough at the bottom. 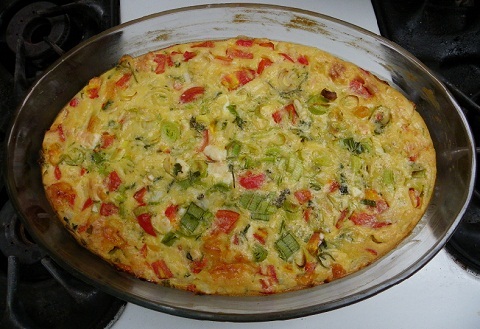 We LOVE quiche at our house – can’t wait to try this one. Thanks, Pauline! This looks so yummy! I love quiche! Savvy Scot recently posted..Your Site or Blog Gets Hacked…. How do you fix it? I can’t say that I’ve had cold quiche….interesting! Is it really better cold than it is warm? This does look exceptionally simple by the way. Thanks so much for sharing; I think it looks better than the quiche recipe I posted the other day! I enjoy it cold, or just a little warm, but not boiling out of the oven. I find the ingredients release more flavor after cooling down a bit. We had quiche all the time as a kid as we’d pull stuff from the garden and throw in some meat with it. This looks incredibly easy to make, which makes it even better. John S @ Frugal Rules recently posted..You Bought That at Walmart?! super easy, and a good way to feed the kids some veggies without complaints! Quiche is by far my favorite meal to make. I make a variety of quiches and wouldn’t be able to not eat them. I don’t know how I feel about doing it without a crust because that is one of the good parts for me. I can understand the problem of the butter though. Thanks for the recipe Pauline. I also had the problem of too much liquid leaving the crust damp, when using zucchinis or mushrooms, it solves that too. I like the crust, thin and not too much, but it takes time to make it, this recipe is really quick. Good point on the damp crust. They do take a long time to make, but are worth it in the end. Awesome. The crust is the part I don’t like about quiche! I’ll have to go this route next month (quiche is an Easter breakfast staple for my wife’s family). since there is flour and melted cheese it holds pretty well. I hope your wife likes it! That looks great! I have been making this quite a bit lately. I do large ones with 12 eggs and a cup of cream and a mix of veggies and cheese. No flour, no crust. After it bakes and then cools I cut it up into 12 squares. I freeze 6 and put 6 in the fridge for breakfasts the following days. Makes our morning routine quick and easy. 12 eggs, that is a great idea, I am trying to get rid of eggs at the moment, the hens laid a lot and don’t hatch. I’ll try it your way, thanks for sharing! Speaking of eggs….when I cracked an egg this morning there was a bit of what looked like blood in it. I’ve never had that happen before. Have you? rarely with industrial eggs, or just a little drop, all the time with our eggs. If we don’t pay attention and the egg has been there a few days, it is either very yellow inside (like the egg was beaten) which I imagine is a rotten non fertilized egg, or bloody, this I think is a dead embryo. Now I crack them all separately before ruining a 10 egg omelet! That’s a great looking quiche. and at $.50 a serving not a bad price at all. It definitely seems like a good catchall for any vegetables you might get from the garden that are about to spoil. Justin@TheFrugalPath recently posted..In Debt and Out of Ideas? Draw Your Purchases. Looks a nice recipe, Pauline. We will try this out I think when we come back from London next week…. Yum yum. I have never tried to make a quiche because I assumed it was hard. This does not look hard. If I can make a beet cake, I can do this, and it’s a great way, besides stir fry, to use up veggies. Kim@Eyesonthedollar recently posted..Does Being Rude Get You Further in Life? the crust is more complex, you have to keep the butter cold enough so it gives consistence to the crust while at the same time melting it a bit with the flour. This is super easy, and you can buy a ready crust too if you’d like. sounds good! I haven’t seen asparagus around here, only in the capital city. I love them. In the Northern half of France, yes, the South is more inclined towards olive oil. I use both, and love butter too but not the yellowish spreads you find here. I prefer to have good quiche ingredients than a $8 bar of butter imported from New Zealand in the crust that I won’t enjoy as much as just on bread. I cook and use both, the olive oil comes from the Cuban family upbringing. The butter from, well just a plain love of butter! One thing we don’t have in the states is good quality butter, our dairy is so over-processed that much of the flavor is processed out of it. My first experience with “good” butter was in France. I’ve never looked at U.S. butter the same since. Sounds delicious, Pauline. I love quiche. While I like the kinds with crusts too, this sounds healthier and a great way to use up leftover veggies. I hate food waste too!